Together, you’ll learn more about the impact of cancer and how you can create a happier, more productive and healthier place to work. 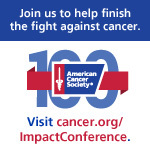 And in honor of our 100th birthday, we're asking conference attendees to join us in embarking on our boldest undertaking yet – to finish the fight against cancer. Download the agenda outline and the workshop session overview to get a glimpse into the program format, which combines the latest solutions, valuable tools, and effective strategies with an outstanding lineup of speakers. Register today to receive a discounted rate of only $250! Early bird registration closes on April 30.